(Michael Mangum | Special to the Tribune) Jordan High senior Crew Wakley (10) looks downfield to make a pass during their prep football matchup against Corner Canyon at Corner Canyon High School in Draper, UT on Wednesday, October 18, 2017. Utah State supplemented its early signing day class with an additional 10 high school commitments Wednesday. Aggies football coach Matt Wells said the program was looking to bolster its offensive and defensive lines, but the best chance for incoming freshmen to make an immediate impact could be at wide receiver. Among the most recent signees was Deven Thompkins, a wideout from Fort Myers, Fla., who will join early signee Tim Patrick from San Diego. Eight of the 10 players inked Wednesday are from Utah. Three of them — defensive lineman Johnson Hansen, defensive back Christian Nash and defensive lineman Seni Tuiaki — played at East High, which finished second to Bingham in Class 6A. Linebackers Mitch Medina from Alta, Karene Reid from Timpview and Highland’s Elijah Shelton also committed to the Aggies. Wells said that Hansen, Reid and Tuiaki are expected to go on LDS Church missions when they graduate, then join the Utah State program. 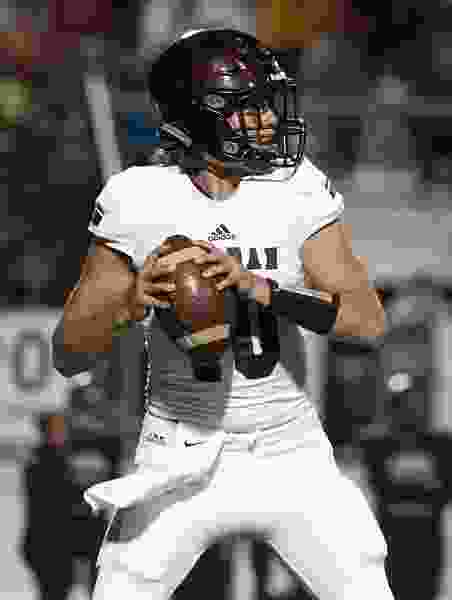 Other commits were Alta quarterback Will Dana, Herriman offensive lineman Karter Shaw and Michael Anyanwu, a cornerback from Covina, Calif.
“I think the two guys that stick out that maybe have a chance to compete early on are Michael Anyanwu and Deven Thompkins,” Wells said. “I think we’ve got some talented freshmen linebackers that we’ve taken right here. Linebacker was a bigger need for us last year in terms of older guys. The Utah State incoming class consists of 22 players. Not all of the players announced on Wednesday will be getting a scholarship. Some, including Dana and Medina, are classified as preferred walk-ons. Meeting with boosters in Salt Lake City Wednesday night, Wells also said the program is holding two scholarships in reserve. Only three of those were junior college transfers (Kyler Hack, Darwin Thompson and D.J. Williams), who all picked the Aggies in December. “Kyler Hack is similar. He’s a junior college offensive lineman, but he’s coming in as a sophomore,” he added. Wells also said that two transfers are part of the incoming class. Tipa Galea’i and Fua Leilua joined the team in the fall and are eligible. Galea’i is a linebacker who played at TCU and will be a junior in the fall. Leilua, also a junior, is a defensive lineman from Spanish Fork who went to Dixie State then Oklahoma State before transferring.